No need to pull up the tile if there’s nothing wrong with it. Just add our anti-slip coating to make it safer to walk on. We know how dangerous some tiles can be when they get wet. Truly, we do, we can measure it! 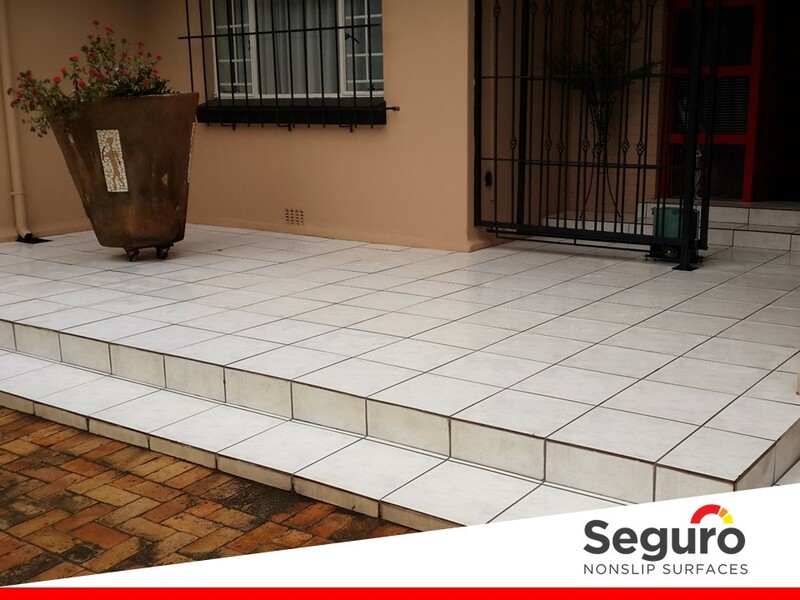 The tiles at the entrance of this house in Waverley, Johannesburg posed a serious problem for the new owner. After a nasty and potentially serious fall, he called Seguro for help. Our first task was to clean the tiles in preparation for the anti-slip coating. The tiles had been here for years and there were hard water stains all along the stairs and under the planters. After a quick clean, we applied our anti-slip coating leaving the tiles beautifully restored to their original colour and a whole lot safer to walk on in the rain.